Husky Car Mats Makes Floor Mats and Floor Liners for Your Car, Pickup or SUV. 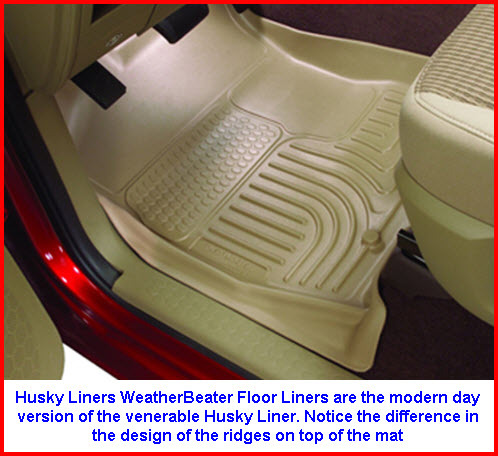 Husky Car Mats or Husky Liner Floor Liners as the folks at Winfield Consumer Products like to call them are your heavy duty solution for a car, pickup, van or SUV floormat. These lifetime warranted, rubberized thermoplastic car mats are custom fit to the complex contours of your vehicles floor pan. They use a raised outer lip and high rise, embossed, ridges on the top of the mat to keep water off your carpeting and your tootsies at the same time. The rubberized vinyl is kinda semi-rigid yet soft and pliable at the same time. This type of material used in conjunction with Husky's patented Sta-Put Nibs on the back of the mats prevent mat slippage on your vehicles carpet. When you buy your Husky Car Mats you are really buying the experience, technology and customer service of Winfield Consumer Products. Winfield CP has been in business since 1988 making consumer aftermarket products for the automotive industry. The company has both a manufacturing and distribution facility in Winfield Kansas, and are as meticulous about the cleanliness of their facilities as they are about the quality of their service. So check out their website and give them a call before you decide what kind of mat to use to protect your vehicle. Husky Car Mats come in 3 different versions. 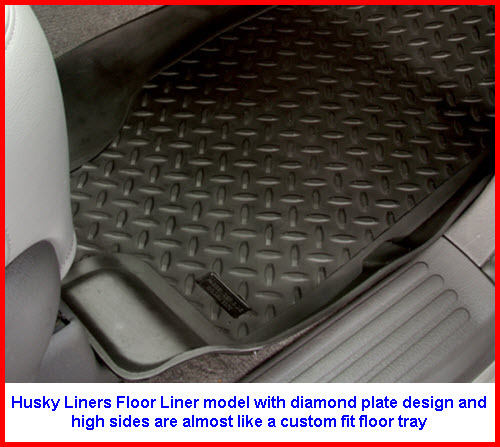 Firstly we have the traditional custom fit Husky Floor Liner made to fit your make and model vehicle with precision. The top of this mat has a diamond plate like design and high sides to trap liquids. Secondly we have the Husky WeatherBeater Floor Liners which are an updated version of the venerable Husky Floor Liner with a more artsy design on the top of the mat. And, thirdly Husky makes their universal fit Heavy Duty Floor Mat product that you can trim to fit for the exact coverage you want on your floor.